Looking to boost your productivity? 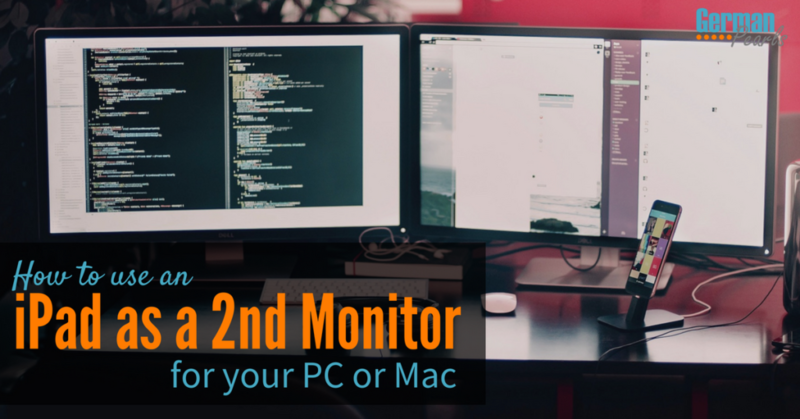 Try using an iPad as a second monitor! Studies (and common practice) have shown that using a dual display system (ie: adding a second monitor to your computer) can increase your productivity by 20-30%. So, while you may not have an extra monitor lying around you probably do have a tablet you can use as a second monitor. A few years ago I added a second monitor to my system at work. I love it! I always have a lot of windows open and reference a spreadsheet to write an email, enter data from a web app into a database, etc. In many of my activities I’m using more than one app or window at the same time. It’s possible to switch back and forth between the applications but it’s much nicer to open one on each display and view them both on my two monitors. I haven’t measured it but I know I can perform tasks much more efficiently than when I wasn’t using a second monitor. When I’m at home working on German Pearls I want the same efficiency of using a dual display system but don’t have a second monitor next to my laptop. I started investigating ways to use my iPad as a second monitor and found one I really like. If you’ve read much on the site you may know already but I’m pretty frugal. I believe it’s my German heritage that makes me reluctant to spend more money than necessary. I think it just feels wasteful to me. At any rate, I say this because I first looked for a free option for using my iPad as a second monitor. After much research and reading, however, I came to the conclusion that there was no reliable way of viewing my computer screen on an iPad without purchasing an app. While there are free apps available for almost anything, I didn’t see one that I thought would be reliable enough to work consistently. So, I actually purchased an app. And I’m glad I did! Duet display is an app developed by ex-Apple engineers. They’ve written this app to enable you to view your computer screen on your iPad. With this app you can use your iPad (or iPhone) as an extra display for your Windows or Mac computer. Get to work using your new dual display computer! Once the iPad is running as a second monitor for your computer you can drag windows over to it. Just move the window to the right of your existing screen and you’ll notice how it just moves onto the second display as if they were connected. Drag things back and forth to give yourself more room to work. It’s like having a bigger desk to spread out on! Now when I use my iPad as a second monitor I feel like I accomplish so much more – I love it! I’ve even upgraded my system with an inexpensive iPad stand. If you have problems or are worried about getting it set up drop me an email and I’ll help out. Sounds like a great setup! Good idea to have the iPad there and respond via voice. Using voice makes things so much faster as well. Why am I even reading this? I don’t have an iPad hahaha. I guess that curiosity is indeed an incurable disease , speaking of curiosity, what about the response time? Do you notice any input lag when using your iPad as a monitor? No, it’s pretty fast. I’m doing basic work (ie: not gaming) and I’m happy with it. Yeah, I was never able to resist the temptation of learning new technology tricks haha. Your website is pretty enjoyable for me. I love new tech tricks too.